SHOULD YOUR INVESTMENT PROGRAM BE A TRUST? When I am at home at night watching TV and see J.K Simmons in the Farmers Insurance commercials utter "we know a thing or two because we've seen a thing or two" I think about our experienced team at Garden State Trust Company. Just between myself, Barbara Kannheiser, Kurt Talke, John Bonk and John Ritter we have over 175 years of combined experience in the trust industry. I can genuinely say, we know a thing or two because we've seen a thing a two in our careers providing personal trust services. Every once in a while, a prospective personal trust client will raise concerns about the size of Garden State Trust Company and its ability to deliver trust services. Our answer is simple; smaller size does not mean a lack experience in personal trust administration. Experience is the most important measure when determining capability and competence. As the founder of Garden State I knew finding the right people would mean bringing on a team that not only had experience but believed in the type of personal service I wanted to provide. We have a team of Trust Officers that are CTFAs (Certified Trust and Financial Advisors) who continually attend seminars and continuing education classes in an effort to not only broaden their knowledge but to also learn best practice solutions to better address client needs. To view our entire team, visit https://www.gstrustco.com/meet-our-team.html. By the time you read this newsletter the official start to Spring will be a few days away. After the terrible cold and wet winter, we have experienced in New Jersey we are deserving of some warm Spring weather. Enjoy! In a recently published Morningstar report, researchers drew upon data from the Federal Reserve Bank's "Survey of Consumer Finances" and the Sallie Mae/Ipsos survey "How America Saves for College" to create two savings simulations. In the first simulation, families continued on their current course, which relied in part upon using ordinary savings and checking accounts for the accumulations. The second simulation exclusively used 529 plans for saving the same amount of money for college. The researchers found that utilizing the 529 plan would increase the amount available for college by roughly 25%. Most of the increase was attributable to the superior investment earnings, not to the tax benefits, although state tax benefits and capital gains tax benefits did play a role. In the aggregate, the report concluded that an additional $237 billion would be available for higher education through full usage of 529 plans, without anyone saving an additional dollar. an infographic to simplify the process of signing up for a 529 plan. They found that the first two approaches did increase usage of 529 plans, while the third one did not. They also warned that what is true in the aggregate may not be applicable to an individual family. Personalized advice is essential to match individual family circumstances to the optimum choice in a 529 plan. © 2019 M.A. Co. All rights reserved. Investors with $50,000 portfolios have stockbrokers, it has been said, while those with $5 million have trust officers. That may be true, but it's also misleading. The fact is, few of our customers are in the truly high-wealth category. A good number of business or professional people, active or retired, count on us to maintain and enhance their hard-won financial independence. Some rely on us to invest significant sums that they have received as a result of a death in the family or the sale of property. All in all, the great majority of trusts in our care are well below the million-dollar level. What sets us apart is the nature and quality of our work. As we see it, each of our trust customers deserves the first-class service that an investor with $5 million expects to receive. Is it time for you to move up to a living trust? These insights into our way of doing things will help you arrive at an informed decision. First, you should understand that we don't claim to be "better" than full-service brokers or financial advisors. We're just different. Buying and selling. Some investment advisors make their money from the commissions that they receive for buying and selling securities for their customers and from profits on new issues of securities that they underwrite and make available to the public. That's not us. We're paid a fee based upon account size. Our compensation goes up only if the account grows in value. Financial management. As a trust institution, our sole concern is to do the best possible job of managing money for our customers. We have no stocks to sell, nor do we look to commissions for compensation. Because we have nothing to sell but service, our success is tightly linked to the success and satisfaction of our customers. We're well aware that in order to prosper we must (1) make our customers' capital grow and (2) serve our existing customers so attentively that they refer new customers to us. This attentiveness is reflected in our insistence on viewing each trust customer as an individual with a unique set of financial aims and circumstances, not merely as an "account." In some respects our services resemble those that an investor might receive from a top-flight investment counseling firm. But here, too, there can be significant differences. We provide each of our trust customers with complete custodial care and record-keeping services. Indeed, we take care of virtually every investment detail that you can think of. Sound convenient? It is. More important, all this attention to detail can result in significant savings over the years. If you've ever mislaid a dividend check, or failed to notice that a bond was called for redemption and had ceased to earn interest, or overpaid your taxes because adequate investment records were lacking, you'll understand what we mean. ﻿Unique advantages. By placing their investable funds in what we call a revocable living trust, our customers are able to take full advantage of our broad and unique capabilities as a trust institution. They (and you) can instruct us to perform a wide variety of special duties, now or in the future. For example, some of our trust customers have a fondness for roaming the world. Who makes sure that their estimated income taxes, property taxes and other recurring payments are taken care of while they're away for extended periods? If they wish, we do. For older men and women, our ability to accept added responsibilities as trustee can result in enhanced peace of mind. It's worrisome to hear of aging friends or relatives who have become incapable of managing their own finances, and even more distressing to hear of problems arising from the appointment of a guardian or conservator. 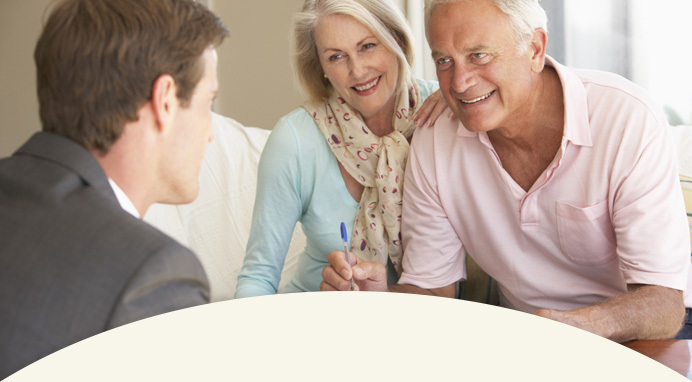 With a well-planned trust agreement, an older person can make arrangements now to minimize financial-management problems in the event of future illness or incapacity. Moving up without "tying up"
When talking with potential customers, we've learned to expect a comment that goes something like this: "A trust sounds like just what I've been looking for--except, I don't want to tie up my money." Like these men and women, you also will be pleased to hear that the terms of a trust can be just as untied as you want to make them. What's more, the type of trust that we're discussing is revocable. That means you're free to cancel the whole arrangement if ever you find a better source of first-class financial management. You're also free to amend your instructions to us as your plans or circumstances change. Ready to move up to a living trust? Call on us! When you owe money to the IRS, does it matter whether it is a tax or a penalty? That question was put to a bankruptcy court recently. John Chesteen filed for bankruptcy in June 2017. The IRS filed a proof of claim for $5,100 in taxes owed. The Service later amended the claim to add $695 in "shared responsibility payment" because Chesteen had failed to have health insurance. Chesteen objected that the shared responsibility payment was a penalty, not a tax, and as such it was dischargeable in bankruptcy. The relevant provision of the legislation uses the word "penalty" 18 times, and never uses the word "tax." The bankruptcy court agreed with the debtor. IRS appealed that decision to a District Court, which has reversed the decision. The Court "looked beyond the labels" to determine that the payment for failure to have health insurance, although intended to spur people to buy such insurance, really functions more as a tax than as a penalty, intended to raise revenue for the government. "The shared responsibility payment is less than the price of insurance, will be collected through the normal means of taxation, and contains no negative consequences except for a payment to the IRS, which is allowed in the law." The bottom line for Mr. Chasteen is that the penalty for failing to have health insurance that he couldn't afford because he was on the verge of bankruptcy will have to still be paid after the bankruptcy proceedings are complete. Note that the shared responsibility payments expired on December 31, 2018. Because of the rapidly changing nature of tax, legal or accounting rules and our reliance on outside sources, Garden State Trust Company makes no warranty or guarantee of the accuracy or reliability of information contained herein nor do we take responsibility for any decision made or action taken by you in reliance upon information provided here or at other sites to which we link. ©2017. All rights reserved.